"Hey Joe, Where You Gonna Go?" 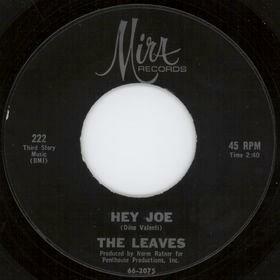 The Leaves' third release of "Hey Joe"
(1965) "Hey Joe, Where You Gonna Go?" (1965) "You Better Move On"
"Hey Joe" is an American popular song from the 1960s that has become a rock standard and as such has been performed in many musical styles by hundreds of different artists. "Hey Joe" tells the story of a man who is on the run and planning to head to Mexico after shooting his unfaithful wife. However, diverse credits and claims have led to confusion as to the song's true authorship and genesis. The earliest known commercial recording of the song is the late-1965 single by the Los Angeles garage band The Leaves; the band then re-recorded the track and released it in 1966 as a follow-up single which became a hit. Currently, the best-known version is The Jimi Hendrix Experience's 1966 recording, their debut single. The song title is sometimes given as "Hey Joe, Where You Gonna Go?" or similar variations. While claimed by the late Tim Rose to be a traditional song, or often erroneously attributed to the pen of American musician Dino Valenti (who also went by the names Chester or Chet Powers, and Jesse Farrow), "Hey Joe" was registered for copyright in the U.S. in 1962 by Billy Roberts. Scottish folk singer Len Partridge has claimed that he helped write the song with Roberts when they both performed in clubs in Edinburgh in 1956. Other sources (including singer Pat Craig) claim that Roberts assigned the rights to the song to his friend Valenti while Valenti was in jail, in order to give him some income upon release. Roberts was a relatively obscure California-based folk singer, guitarist and harmonica player who performed on the West Coast coffeehouse circuit. He later recorded the country rock album Thoughts of California with the band Grits in San Francisco in 1975, produced by Hillel Resner. Resner has stated that a live recording of Roberts performing "Hey Joe" exists, dating from around 1961. Roberts possibly drew inspiration for "Hey Joe" from three earlier works: his girlfriend Niela Miller's 1955 song "Baby, Please Don’t Go To Town" (which uses a similar chord progression based on the circle of fifths); Carl Smith's 1953 US country hit "Hey Joe!" (written by Boudleaux Bryant), which shared the title and the "questioning" format; and the early 20th century traditional ballad "Little Sadie", which tells of a man on the run after he has shot his wife. The lyrics to "Little Sadie" often locate the events in Thomasville, North Carolina, and "down in" Jericho, South Carolina (a large rice plantation in the lowlands) Roberts was himself born in South Carolina. Variations of "Little Sadie" have been recorded under various titles (including "Bad Lee Brown", "Penitentiary Blues", "Cocaine Blues", "Whiskey Blues") by many artists, including Clarence Ashley (1930), Johnny Cash (1960 & 1968), Slim Dusty (1961), and Bob Dylan (1970). Some versions change the southbound location from Jericho (South Carolina) to Mexico. Despite extensive archives of U.S. folk and blues music, and studies of the same, in the Library of Congress, the Smithsonian Institution, and other bodies, no documentary evidence has been provided to support the claim, by Tim Rose and others, that "Hey Joe" is a wholly traditional work. Rights to the song were administered from 1966 into the 2000s by the music publisher Third Story Music (now Third Palm Music); there the author is listed as Billy Roberts. "Hey Joe (Where You Gonna Go)"
Roberts' song gained fans in the Los Angeles music scene of the mid-1960s, which led to fast-paced recordings in 1965 and 1966 by The Leaves, The Standells, The Surfaris, Love, The Music Machine, and The Byrds, swiftly making the song a garage rock classic. Both Dino Valenti and The Byrds' David Crosby have been reported as helping to popularize the song before it was recorded by The Leaves in December 1965. The Leaves, who had been introduced to the song while attending live concerts by The Byrds (who had yet to record their own version of the song) at Ciro's on Sunset Boulevard, recorded and released three versions of "Hey Joe" between 1965 and 1966. Their first version was released in November/December 1965 but sold poorly. The band's third recorded version of the song became a hit in May/June 1966, reaching No. 31 on the Billboard Hot 100 chart and No. 29 on the Canadian RPM Magazine charts. The Leaves' version is notable for being the only recording of the song to reach the Top 40 of the Billboard chart. The Surfaris recording of the song, released on the B-side of their "So Get Out" single, is sometimes cited as being the first rock recording of the song but a number of reliable sources contend that, in fact, the Surfaris' version dates from 1966, well after The Leaves' original 1965 version. There is some dispute over exactly when The Surfaris' recording of the song was released. Some sources list its release date as being late 1965 but there are many other sources that list it as being June 1966. However, the catalogue number of The Surfari's single is Decca 31954, which when cross-referenced with other contemporaneous Decca single releases, allows the single to be conclusively dated to a May – June 1966 time frame. A June 1966 release date is further corroborated by the discographical information on Gary Usher's website. Usher was the producer of The Surfaris' recording of the song and the discographical information on his website comes from the late producer's personal archives, as compiled by his biographer Stephen J. McParland at the request of the Usher family. The Standells recorded a version of the song, titled "Hey Joe, Where You Gonna Go", which was included on their 1966 Dirty Water album. The garage rock band, The Music Machine, recorded a slow, moody, fuzz-laden version of the song in late 1966 which bears a strong resemblance to Jimi Hendrix's later version. The Los Angeles band Love included a version of "Hey Joe" on their debut album, Love, recorded in January 1966 and released on Elektra Records in April. The song was brought to the band by guitarist and singer, Bryan MacLean, who had been introduced to the song by David Crosby during 1965, while MacLean had been a roadie for The Byrds. The band's lead vocalist, Arthur Lee, claimed in later years that it was Love's version that turned Jimi Hendrix onto the song as well as most of the other Los Angeles acts who covered the song. Love's recording of "Hey Joe" features slightly different lyrics to most versions of the song; for example, the lyric "gun in your hand" became "money in your hand" in Love's version. The Byrds recording of the song also features the same altered lyrics as Love's version. Love guitarist Johnny Echols claims that Love's and The Byrds' lyrics are the authentic ones. According to Echols, The Leaves (with whom they were friends) had heard Love performing the song and asked them for the lyrics. He rewrote them to play The Leaves a "dirty trick", accidentally authoring the version that everybody got to know. The Byrds included a recording of the song, titled "Hey Joe (Where You Gonna Go)", on their 1966 album, Fifth Dimension. The lead vocalist on The Byrds' version was David Crosby, who was instrumental in bringing the song to the group and in popularising the song within the larger L.A. music community. Crosby had wanted to record the song almost since the band first formed in 1964 but the other members of The Byrds had been unenthusiastic toward the song. By the time of the recording sessions for Fifth Dimension, several other bands had enjoyed success with covers of "Hey Joe", leaving Crosby angered by his bandmates' lack of faith in the song. Byrds' guitarist and band leader Roger McGuinn recalled in an interview that "The reason Crosby did lead on 'Hey Joe' was because it was his song. He didn't write it but he was responsible for finding it. He'd wanted to do it for years but we would never let him. Then both Love and The Leaves had a minor hit with it and David got so angry that we had to let him do it." General consensus within the band and among critics was that The Byrds' version wasn't an entirely successful reading of the song and was inferior to previous recordings of the song by Love and The Leaves. In later years, both McGuinn and the band's manager, Jim Dickson, criticised Crosby's vocal performance on the song for not being powerful enough to carry the aggressive subject matter and expressed regret that the song had been included on Fifth Dimension. Even Crosby himself later admitted that the recording of the song was an error on his part, stating "It was a mistake, I shouldn't have done it. Everybody makes mistakes." The song would go on to become a staple of The Byrds' live concert repertoire during 1966 and 1967. The band also included the song in their performance at the Monterey Pop Festival, which is included on the 2002 The Complete Monterey Pop Festival DVD box set as well as on the 1992 The Monterey International Pop Festival CD box set. Released in December 1966, Hendrix's version became a hit in the United Kingdom, entering the Top 10 of the UK Singles Chart in January 1967 and peaking at #6. The single was released in the United States on May 1, 1967 with the B-side "51st Anniversary" but failed to chart. 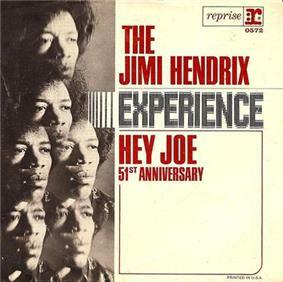 "Hey Joe", as recorded by The Jimi Hendrix Experience, with backing vocals by the Breakaways, remains the best-known version of the song and is listed as No. 201 on Rolling Stone magazine's The 500 Greatest Songs of All Time. In 2009 it was named the 22nd greatest hard rock song of all time by VH1. "Hey Joe" was the last song Jimi Hendrix performed at the Woodstock festival in 1969 and as such, it was also the final song of the whole festival. The song was performed after the crowd, comprising the 80,000 who hadn't yet left the festival, cheered for an encore. Cher recorded a version of "Hey Joe" in 1967 on her album With Love, Chér. Deep Purple included the song as the eighth and final track on their 1968 debut album, Shades of Deep Purple and initially listed their own bandmembers as the songwriters. Deep Purple's arrangement of the song includes elements of classical music, including parts from the Miller's Dance, suite no. 2, part 2 of El sombrero de tres picos ballet by Manuel de Falla, on a rhythm reminiscent of the Boléro by Maurice Ravel. Marmalade recorded a version of the song in 1968 because they needed a B-side to their single "Lovin' Things" in a hurry, and because they thought it was a traditional song and as such, the band would get the songwriting royalties from it. Marmalade guitarist Junior Campbell stated in interview that "Jimi Hendrix's version had already sold about 200,000 copies and then we sold about 300,000 on the flip of 'Lovin' Thing'. But then the following year, the bloke who'd written the bloody song suddenly turned up out of the woodwork!". Frank Zappa recorded a parody of the song, titled "Flower Punk", on The Mothers of Invention album We're Only in It for the Money in 1968. The song was one of several on the album that parodied the fashionable hippie lifestyle. Lyrics in Zappa's version included "Hey Punk, where you goin' with that flower in your hand?/Well, I'm goin' up to Frisco to join a psychedelic band." Zappa also included the opening chord riff of "Hey Joe" in the song "Honey, Don't You Want a Man Like Me?" from his Zappa in New York album. Patti Smith released a cover of the song as the A-side of her first single, "Hey Joe" b/w "Piss Factory", in 1974. The arrangement of Smith's version is based on a recording by blues guitarist Roy Buchanan that was released the previous year (and dedicated to Hendrix). Smith's version is unique in that she includes a brief and salacious monologue about fugitive heiress Patty Hearst and her kidnapping and participation with the Symbionese Liberation Army. Smith's version portrays Patty Hearst as Joe with a "gun in her hand". Sonic Youth's song "Hey Joni", included on their 1988 album, Daydream Nation, is titled in reference to "Hey Joe" and to Joni Mitchell but it shares no lyrical themes with the Billy Roberts' song. The rock band The Who occasionally performed "Hey Joe" during their 1989 tour. Their version was influenced by Jimi Hendrix's arrangement and was dedicated to him. Willy DeVille recorded a charanga version of the song that was a hit in Europe in 1992, going to No. 1 in Spain. The song was released as a single in Europe and appeared on DeVille's Backstreets of Desire album. Type O Negative re-titled the song as "Hey Pete" (in reference to frontman Peter Steele) on their 1992 The Origin of the Feces album and changed the song's protagonist to an axe-murderer. This fit the song into a story arc spanning several of the band's own compositions. 1,881 guitarists played "Hey Joe" in Wrocław on May 1, 2007, setting what was, at the time, a new Guinness record. The Red Hot Chili Peppers were seen in 2006 rehearsing the song on the TV program Live From Abbey Road on Channel 4. 1,572 guitarists played "Hey Joe" simultaneously in the town square of Wrocław, Poland on May 1, 2006, breaking a Guinness record. A new record was set when 1,881 guitarists played "Hey Joe" in Wrocław on May 1, 2007. Then on May 1, 2008, 1,951 guitarists played "Hey Joe" in Wrocław to set a new world record. The record was further broken in Wrocław on May 1, 2009, when 6346 guitarists played the song in the same venue. A new record was set on May 1, 2012, when 7,273 guitarists turned out in Wrocław. Sample of Cher's recording of "Hey Joe". The song was released as a single and included on the 1967 album With Love, Chèr. The Leaves as "Hey Joe, Where You Gonna Go" (Mira 207, December 1965); re-recorded as "Hey Joe, Where You Gonna Go" (Mira 222, 1966), and then again as "Hey Joe" (Mira 222, May 1966). This last version charted, peaking at No. 31 in the US. The Jimi Hendrix Experience (1966) Peaked at UK No. 6. In 2000, Total Guitar magazine ranked it as the 13th greatest cover version of all time. Cher (1967) on her album With Love, Cher. Peaked at US No. 94. Allmusic wrote a mixed review by calling it "tough" and "not so spectacular" and also "clearly the wrong material for this great singer." Wilson Pickett (Atlantic 2648, July 1969) Peaked at No. 29 on the US R&B charts, No. 59 on the US pop charts, No. 42 on the Canadian RPM Magazine charts, and No. 16 on the UK charts. Featured Duane Allman on guitar. The Standells (1966) on their album Dirty Water as "Hey Joe, Where You Gonna Go?" The Guess Who? (1967) on the bootleg live album "Live in Winnipeg". The Arbors (1969) on the album The Arbors: featuring "I Can't Quit Her" / "The Letter"
Patti Smith (1974) her first music single. Rambo Amadeus (1989) on the album Hoćemo gusle as "Čovek sam, ženo"
Seal (1991) on the "Killer" single; later included on the Set It Off Soundtrack album (1996). Brazilian Band O Rappa (1996) recorded a Portuguese version on the album Rappa Mundi, with considerably different lyrics and plot. Guitar Shorty (1996) on the album Billie Jean Blues. Guitar Shorty is Jimi Hendrix's brother in law. Arklio Galia (2007) Lithuanian version called "Ei, Juozai" on their debut album. "Hey Joe" as performed by The Jimi Hendrix Experience also appears in the Deep Space Nine episode "Past Tense". A version sung by Michael Pitt with the band The Twins of Evil features in the film The Dreamers. The Roger Waters' song "Folded Flags" from the soundtrack to the film, When The Wind Blows, features a reference to "Hey Joe" in the lines "Hey Joe, where you goin' with that gun in your hand?" and "Hey Joe, where you goin' with that dogma in your head?" Linkin Park's Mike Shinoda sampled Hendrix's version for his "Jimi Remix" of the Styles of Beyond's song "Bleach", which appeared on Fort Minor's We Major mixtape. Rapper Fat Joe used the lines, "Hey Joe, where you going with that gun in your hand" (performed in a style reminiscent of the Jimi Hendrix recording of "Hey Joe") in his song "Joey Don't Do It" from his 2009 album Jealous Ones Still Envy 2 (J.O.S.E. 2). The professional wrestling stable, known as the "b-team" nWo, made use of several Hendrix samples, including a small section of "Hey Joe", in their entrance music. ^ "Hey Joe (album) review". ^ Hicks, Michael. (2000). Sixties Rock: Garage, Psychedelic, and Other Satisfactions. University of Illinois Press. p. 55. ^ a b c d e f "Hey Joe Versions". heyjoeversions.wordpress.com. Retrieved 2009-07-25. ^ a b c d "Hey Joe". Tom Simon's Rock-and-Roll Page. Retrieved 2009-07-25. ^ a b c "Hey Joe review". ^ a b c "Introduction". The Official Tim Rose Website. Retrieved 2010-02-28. ^ a b Rogan, Johnny. (1996). Fifth Dimension (1996 CD liner notes). ^ a b "Billy Roberts Biography". www.billystapleton.com. Retrieved 2009-07-25. ^ "Billy Roberts & Grits LP auction details". Popsike.com. Retrieved 2010-02-28. ^ "More about Billy Roberts". heyjoeversions.wordpress.com. Retrieved 2012-03-30. ^ Beissel, Kim. (2004). Original Seeds Vol. 2: Songs that inspired Nick Cave & the Bad Seeds (2004 CD liner notes). ^ "Classic Old-Time Music from Smithsonian Folkways". ^ "Latest Releases". Slim Dusty Home Page. Retrieved 2010-02-28. ^ "Sam DeVincent Collection of Illustrated Sheet Music 1790 – 1987". ^ "Hey Joe Where You Gonna Go legal copyright". ^ a b c d e f g h Rogan, Johnny. (1998). The Byrds: Timeless Flight Revisited (2nd ed.). Rogan House. ^ a b Hicks, Michael. (2000). Sixties Rock: Garage, Psychedelic, and Other Satisfactions. University of Illinois Press. ^ Joynson, Vernon. (1997). Fuzz, Acid and Flowers (4th Edition). Borderline Productions. ^ "Hey Joe Release Chronology". Information Is Not Knowledge. Retrieved 2009-07-26. ^ Wipe Out: The Singles Album 1963–67 (1987 LP liner notes). 1987. ^ a b "Gary Usher Discography 1960–1966". www.garyusher.com. Retrieved 2009-07-26. ^ "The Original Gary Usher Web Page". www.garyusher.com. Retrieved 2009-07-26. ^ "(Turn On) The Music Machine review". ^ Hoskyns, Barney. (2001). Arthur Lee: Alone Again Or (Mojo Heroes). MOJO Books. ^ "Hey Joe by Love – Lyrics". DM's Music History site. Retrieved 2009-08-13. ^ "Hey Joe by The Byrds – Lyrics". The Byrds Lyrics Page. Retrieved 2009-08-13. ^ Sandoval, Andrew. (2003). Love (2003 CD liner notes). ^ Fricke, David. (1996). Fifth Dimension (1996 CD liner notes). ^ "The Complete Monterey Pop Festival – Menu Options". ^ "The Monterey International Pop Festival box set review". ^ Talevski, Nick (2006). Rock Obituaries - Knocking On Heaven's Door. ^ a b "Chas Chandler Biography". ^ "Haunted track listing". The Official Tim Rose Website. Retrieved 2010-02-28. ^ "We Are Paintermen review". ^ Brown, Tony. (2000). The Complete Book of the British Charts. Omnibus Press. ^ "Jimi Hendrix discography – Are You Experienced era". Ander's Jimi Hendrix Page. Archived from the original on October 26, 2009. Retrieved 2009-07-27. ^ "The RS 500 Greatest Songs of All Time (101–200)". Rolling Stone. Retrieved 2010-02-28. ^ "spreadit.org music". Retrieved February 7, 2009. ^ "Jimi Hendrix – Live at Woodstock review". ^ Side 2 Label. Retrieved 2 Mar 2015. ^ a b Dopson, Roger. (2003). I See The Rain: The CBS Years (2003 CD liner notes). ^ "Flower Punk lyrics". Information Is Not Knowledge. Retrieved 2009-07-27. ^ "Patti Smith: Commercial Discography". A Patti Smith Babelogue. Retrieved 2009-07-27. ^ a b "Patti Smith Biography". ^ "Hey Joni". www.sonicyouth.com. Retrieved 2009-07-18. ^ "The Who – 1989 Concert Set Lists". The Who Concert Guide. Retrieved 2009-07-27. ^ "Interview with Willy DeVille". Willy DeVille fan site. Retrieved 2010-02-01. ^ "Largest Guitar Ensemble – Guinness World Records". wordpress.com. Retrieved 2011-02-03. ^ "Jimi Hendrix Tribute Breaks Guinness Record for Largest Guitar Ensemble". guitarworld.com. Retrieved 2012-07-04. ^ "The Best Cover Versions Ever". Total Guitar (Future Publishing). August 2000. ^ "Hobo – Üdvözlöm weboldalamon!". Hobo.hu. September 25, 2012. Retrieved 2012-10-30. ^ a b "Jimi Hendrix Soundtrack Contributions". ^ "When The Wind Blows lyrics". Roger Waters International Fan Club. Retrieved 2010-02-17. ^ "We Major review". Mixtape Buzz. Retrieved 2009-07-29. A comprehensive list of versions of "Hey Joe"
"I Knew I'd Want You"
"She Don't Care About Time"